There are two kinds of glare. 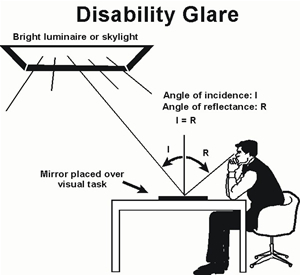 Disability glare results when a light source reflects from or otherwise covers the visual task, like a veil, obscuring the visual target, reducing its contrast and making the viewer less able to see and discriminate what is being viewed. The problem is illustrated with the drawing below. In the example below, bright light from a ceiling light fixture or skylight is reflected from the visual task surface, and into the observer's eyes, veiling his recognition of the target visual content. Nearly as much light is reflected from the white paper as from the black ink making the letters, so that the contrast is low and the text is washed out and difficult to read. Such glare "disables" the process of reading. 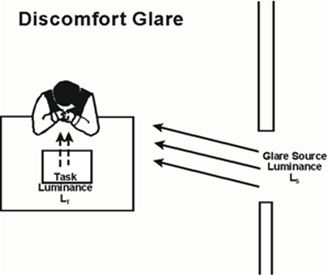 Discomfort glare arises when light from the side of the task is much brighter than the light coming from the task. The eyes attempt to focus on the light from the task, but so much extra light is entering the eye from the side that the visual processes are confused and it is difficult to concentrate for long periods. 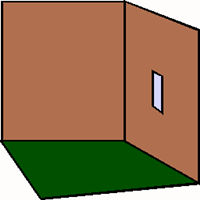 The geometry is illustrated below. In the example below, light from a window enters the reader's eyes and makes it difficult to see the lesser amount of light coming from the reading task. Prolonged exposure to such conditions can result in headaches and eye fatigue. There are many potential sources of glare within buildings. They include direct sunlight, reflected beam sunlight, a bright window surrounded by dark walls and furnishings, poorly designed electric lighting systems, and improperly used luminaries. The first step in avoiding direct beam sunlight is to understand the paths the sun takes through the sky each day. The extremes are illustrated in these drawings for the summer and winter solstices in the northern hemisphere. 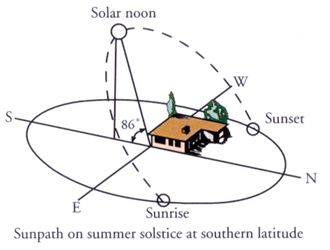 In summer, the sun rises north of due east, sets north of due west, and is high in the sky at noon. The more northern the latitude, the lower in the sky the Sun will be at noon. 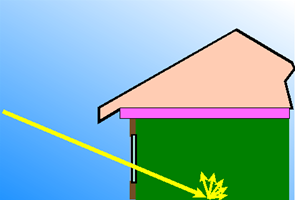 A solution is to shade the window from direct sunlight using a roof overhang to block the high sun near noon. Note that the sun is between west and northwest in the afternoon in summer in the northern hemisphere. Judicious use of shades can block direct sunlight during times of peak glare and summertime solar heating while still admitting natural daylight from the sky and surrounding scenery and objects. 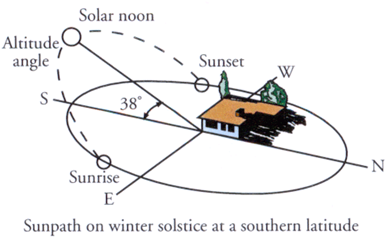 In winter, the Sun rises south of due east, sets south of due west, and is low in the sky at noon. The winter sun lies between east and northeast in the morning so to shade an east window in midwinter mornings will require a way to block the sun over the range from southeast to east. For a west window on midwinter afternoons we'll need some means for blocking the sun over the range from southwest to west. Overhangs are not as effective blocking midday sun in winter because the sun is significantly lower in the sky then. 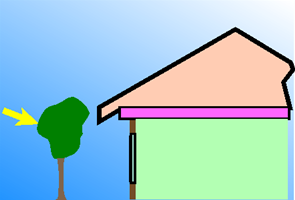 It is not just the direct sunlight that can be glaring, but its reflection from objects in the room can also produce serious glare, as illustrated in the drawing below. A solution is to place a tree or other shading device outside the window in just the right position to block direct sunlight entry when the sun is in the portion of the sky producing the greatest glare problem. As seen below, there is great variety in the kinds of exterior shades available to alleviate this problem. Glare can come not only from direct beam sunlight, or its reflections, but from the window itself, even when no direct sunlight enters. When the scene outside the window is bright, this makes the window appear much brighter than the surrounding features in the room, causing it to be a potential glare source, according to the two definitions of glare listed above. In the first case, you can put a tinted plastic covering (window film), or an interior shade on or covering the window glass. 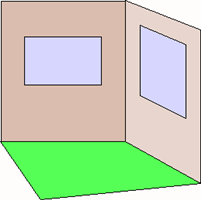 If this window is the only source of light in the room, however, the ratio of window to room brightness will be approximately as before, and the glare problem will not be solved. If the room is electrically illuminated, however, window film can be an effective glare strategy. This is not an energy efficient solution, however, since it requires more electric lighting than would be the case with a well-designed daylighting system for the room. In the second case, you can increase the electric lighting in the room, to illuminate room surfaces better and better matching the brightness of the window. Of course this costs more electrical energy, so a better option would be to paint the room with a higher reflectance paint, making the walls brighter. Extending this to the ceiling (if darker than needed) and the room furnishings and floor covering will provide additional help in brightening the room. If we are determined to minimize daytime electric lighting energy use, however, another solution would be to make the window larger. This may seem counter intuitive, until you realize that a larger window is no brighter—point for point across its aperture—than a small one seeing the same exterior scene, but the larger window allows more daylight flux into the room, better illuminating the walls, ceiling, and floor. This makes the room surfaces brighter, closer to the brightness of the window. If you are in a hot climate, however, and the window is oriented to admit direct beam solar radiation for significant portions of the hottest parts of the day, this good glare mitigation strategy can have adverse comfort and energy consequences, since the extra solar heat gain can produce localized overheating and make the air cooling system work harder, at higher energy and dollar costs. The problem is illustrated in these drawings.